The color management mavens extraordinaire at X-Rite have just announced two new products for photographers who shoot video with video cameras or with DSLRs… ColorChecker Video and ColorChecker Passport Video. Frequent Photofocus readers know I am a huge proponent of using X-Rite’s ColorCheckers to ensure my still photographs are color accurate. I have used the standard 24-patch target since 1981 when I purchased my first one (still have it.) Then, I used it to determine the filter pack for a given emulsion of film to bring its colors to a neutral state. Now, I use the same target in the Passport to color manage my RAW files. This worked great for stills, but when it came to video the still version just wasn’t the ticket. Time for full disclosure: I am an X-Rite Coloratti and participated in the beta testing for these new targets. 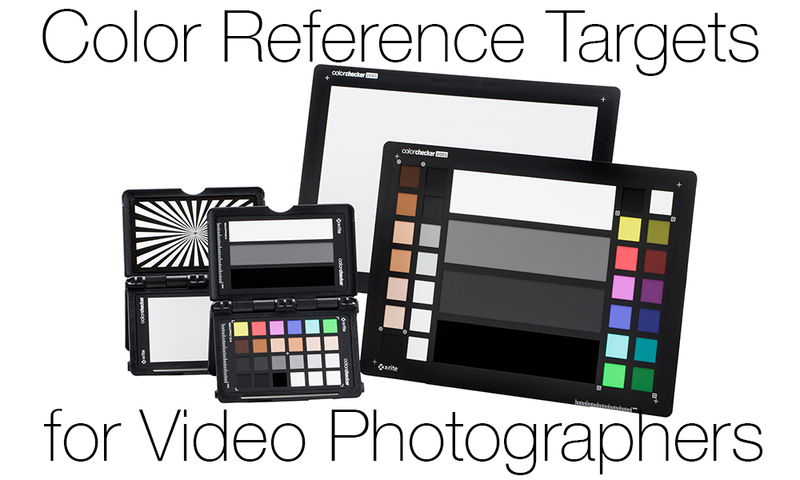 These new ColorChecker Video targets are formulated purely for video. The question that will be asked a lot is “Why not just use the classic 24 patch target?” There are several distinct differences between still and video photography. The classic target has too many colors and not enough skin tones. The black patch is really a dark gray on the classic version. The video ColorCheckers have a glossy, deep, truly black patch. White balancing a video camera with the ColorChecker Video. The ColorChecker Video is 65% light gray on one side for setting white balance on video cameras. As will all ColorCheckers, the gray is colorimetrically neutral. The other side is more complex. It has a column of skin tones ranging from light to dark with varying undertones. Next is a grayscale column. In the center are four patches from white, 40 IRE Gray, Dark Gray and HIgh Gloss Black. These are used to set both vectorscope and waveform values. On the right there are two columns of identical colors, the left is saturated while the right is desaturated. The passport version has many of the same features and one the video version doesn’t. They are all packed into a compact, pocket sized case. The left side is the grayscale target containing white, 40 IRE Gray and Black patches. The right has four columns of patches. The first is the Chromatic with Yellow, Red, Magenta, Blue, Cyan and Green. Next is the skin tone column from light to dark with different undertones. The third column is grayscale while the fourth is the highlight and shadow grays with a high gloss black that is dark enough to capture the range of digital cameras. The other two sides of the Passport Video is white balance patch (65% light gray colorimetrically neutral,) and the focus target. X-Rite says these new ColorCheckers for video photographers will be available on November 23, 2015. The ColorChecker Video is priced at $129.00 / 125.00. The ColorChecker Passport Video costs $149.00 / 143.00. Having used these two targets and, sadly having had to send them back, I can vouch for them for working with video in managing color between cameras and in differing lighting situations. I’m currently working on a video project that has so far covered eighteen months. My biggest gripe with X-Rite is that these weren’t available a couple of years ago. Needless to say, I have these on my “must have” list for November twenty-third. Kevin is a commercial photographer based in Atlanta. He works for fashion, architectural, manufacturing and corporate clients. When he’s not shooting, he is an author for Photofocus.com and contributes to Photoshop User magazine.